U2 played at Nacional Stadium in Santiago, Chile last Sunday (Feb. 26). The show was so moving that the full band said goodbye at the end of the show, speaking on the microphone one by one. 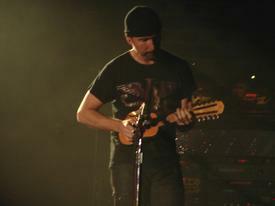 Bono opened a champagne bottle to celebrate the show’s success. Aw, what a cute little guitar! Is there any audio of “Mothers of the Disappeared”? The show will be aired by TVN channel (Television Nacional de Chile) in the future – so stay tuned! I think it is brilliant that he got that instrument at 7PM that night and by showtime had worked something out on it. Especially considering the thing has 10 strings. Genius indeed.